When I opened up Alma and How She Got Her Name, I knew it would become an instant classic in our home and spawn lots of conversations. True story: My 4-year-old has decided her middle name is Tree. Yes, Tree, as in “a woody perennial plant, typically having a single stem or trunk growing to a considerable height and bearing lateral branches at some distance.” Her actual middle name is Jane, but she insists it’s Tree. Alma and How She Got Her Name is about another little girl who isn’t pleased with the name she’s been given. Alma’s full name is Alma Sofia Esperanza José Pura Candela, and it’s just too long. Who needs six names?!? It turns out Alma does. When Alma’s father tells her the story of how her name came to be, Alma realizes it’s just the right size for her. Every name has a story. I’m Jessica because my three older siblings had “J” names and my parents didn’t want me to feel left out. My middle name is an echo of my grandmother’s. My daughter isn’t named after anyone, but her name is a true reflection of who she is and who she will become. I love how Alma and How She Got Her Name celebrates past, present and future. 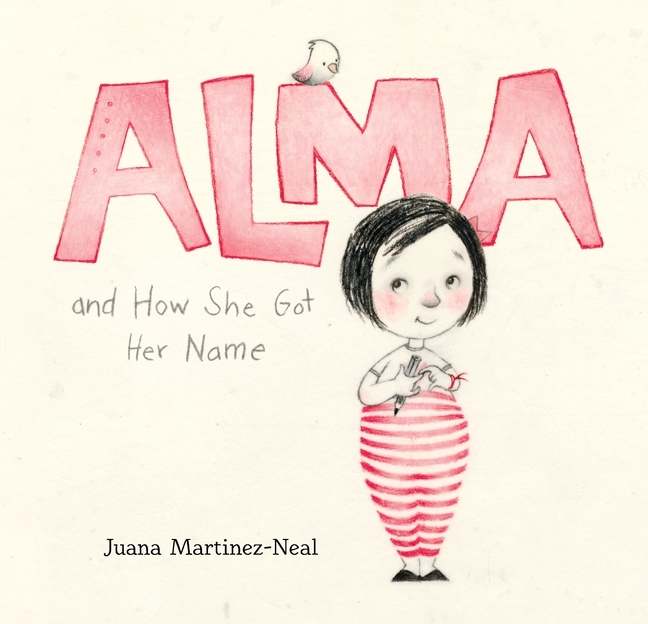 The muted colors used by debut author-illustrator Juana Martinez-Neal are perfectly suited to Alma’s story, and the stylized illustrations are fantastic. I can’t wait to see more from this author/illustrator!